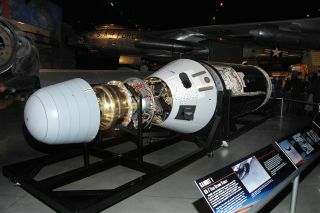 Gambit 1 KH-7 is one of three formerly classified reconnaissance satellites that went on display at the National Museum of the U.S. Air Force in Dayton, Ohio, starting Jan. 26, 2012. A trio of once-secret U.S. spy satellites built to look down on the Soviet Union were unveiled in Ohio on Thursday (Jan. 26) in a rare public display by the United States Air Force. The vintage reconnaissance satellites joined the Cold War Gallery at the National Museum of the U.S. Air Force in Dayton, Ohio, and will eventually be installed in a new wing for space relics and other aircraft. The satellites — called KH-7 Gambit 1, the KH-8 Gambit 3 and the KH-9 Hexagon — were officially declassified in September by the National Reconnaissance Office and released for public viewing. "Last year the NRO celebrated its 50th anniversary, and we announced the declassification of two NRO systems, Gambit and Hexagon, which were America's eyes in space and the most sophisticated satellites of their time," NRO director Air Force Gen. (Ret.) Bruce Carlson said in a statement. "These systems were critical for monitoring key targets in the USSR and around the globe and provided much-needed cartographic information to the DOD to produce accurate, large-scale maps." The Gambit and Hexagon spy satellite systems were among the most prolific U.S. space reconnaissance systems used between the 1960s and 1980s. With a resolution of between 2 to 3 feet (0.6 to nearly 1 meter), the spacecraft used high-resolution cameras to photograph areas of interest, then return the film to Earth in special re-entry capsules. The capsules plunged through Earth's atmosphere, then deployed a parachute so they could be caught in mid-air by Air Force aircraft, museum officials explained. The Gambit 1 satellites flew between 1963 and 1967 and served as the first American high-resolution space reconnaissance system. They carried about 3,000 feet (914 meters) of film and were designed for short-term missions of about six and a half days. Each Gambit 1 satellite was about15 feet (4.5 m) long, 5 feet (1.5 m) wide, and weighed about 1,154 pounds (523 kilograms), according to NRO records. In all, 38 Gambit missions were launched from Vandenberg Air Force Base in California, though 10 flights failed. Gambit 3 satellites were the same width as the Gambit 1 models, but also slightly longer — reaching about 29 feet (9 m) in length. They flew on 54 missions between 1966 and 1984, with four recorded failures. The Gambit 3 series satellites carried 12,241 feet (3,731 meters) of film and were designed for longer missions of up to 31 days, according to NRO records. Like the Gambit satellites, the Hexagon system also launched from Vandenberg and were the last U.S. reconnaissance satellites to use photographic film. They were also the largest — each Hexagon satellite was the size of a school bus and carried 60 miles of film, earning it the nickname "Big Bird." The U.S. military launched 20 Hexagon spy satellites between 1971 and 1986, with one mission suffering a launch failure. Each Hexagon satellite mission lasted about 124 days, with each satellite carrying four film re-entry canisters, according to NRO documents. Their onboard camera systems could photograph wide swaths of terrain and capture about 370 nautical miles — the distance from Cincinnati to Washington — in each 6-inch frame. According to Air Force museum officials, the Hexagon satellites photographed about 877 million square miles of the Earth's surface during their tenure. "Gambit 1, Gambit 3 and Hexagon satellites are significant and rare artifacts, which will enable us to better present the story of Air Force operations in space," said Lt. Gen. (Ret.) Jack Hudson, the Air Force's National Museum director, during the Jan. 26 exhibit dedication. "The Air Force has provided launch, tracking, control and range safety services for reconnaissance satellites throughout the entire Cold War, and it continues these activities today." The Gambit and Hexagon satellites are currently on display in the museum's Cold War Gallery, but will eventually be moved to a new building that will house a Space Gallery, Presidential Aircraft Gallery and Global Reach Gallery, museum officials said.